In the early 40's, the small swimwear brand Sundek was established at the coast of California. That moment, the brand could never dream that its popularity would take legendary forms in just thirty years. Let’s go back to 1958, when Sundek focused itself as one of the first on the new, trendy sport of surfing. The American brand decided to expand its collection with specially designed swimwear: the material consisted of nylon, the prints were tropical and colourful and instead of a zipper, the pants contain Velcro. From that moment, the birth of surf shorts was a fact and Sundek expanded its market area gradually. 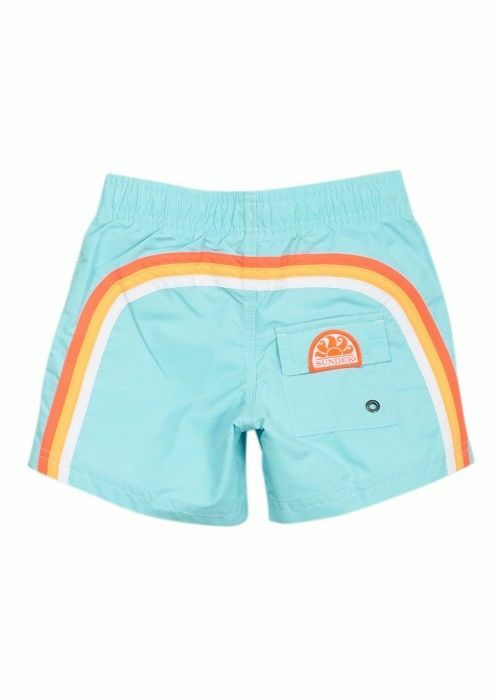 With the release of the 'Rainbow boardshort’ in 1972, Sundek was definitely an icon among surfers. The pants, made of double layer, quick-drying nylon, was originally designed for the surf sport but became an absolute classic in the beachwear collection: every surfer knows the boardshort with the characteristic rainbow on the back. Generations of young people fell in love with the relaxed lifestyle of surfing. 'The easy way of life' was a popular motto and Sundek benefited from the success of surfing. Today, the brand has a large collection of urban wear, from tough tops to stylish polo shirts and from sports jackets to warm sweaters. The sporting tradition is clearly visible in the Sundek collection and the surfing icon likes to show its love for the beach life. As residents of Vlieland, the small island with its own surf school, we share the special feeling.